Last weekend, Rob and I had pre-Christmas dinner with his family. Our families are located a bit too far from each other to want to drive between both cities on Christmas Day so we went to Woodstock a week earlier. Rob’s mom was a sweetie and gave me full reign over the kitchen to whip up a few dishes. She took care of the traditional Polish dishes while I had more of a hybrid/fusion contribution with braised cabbage, borscht (recipe to come) and this kale salad. In the aftermath of the gathering, Rob let me know that his parents couldn’t stop raving over this kale salad. People raving over kale salad, doesn’t that make your heart skip a beat? 😉 First of all, let me apologize for the less-than-stellar photos. That’s the sacrifice for making a new recipe for guests away from home. Trust me, though, that the salad is stellar. Wilted kale. Garlic roasted butternut squash. Pomegranate arils. Smothered with a lemony vinaigrette. Oh so festive with a green base and sparkly red jewels. 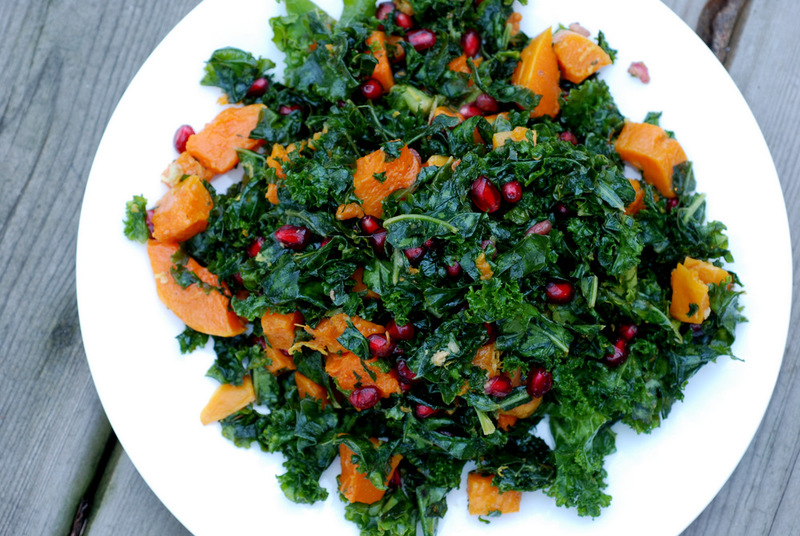 This is my version of Sarah’s Poppy Seed-Crusted Butternut Squash with Kale and Pomegranate Salad. As you can tell, I nixed the poppy seeds altogether. And the shallots. I also increased the amount of garlic, added a lot more kale and used more fresh lemon juice and salt. It is hard to muck up a salad with such delicious ingredients, so add what you like. 🙂 This made a ton of food, and the beauty of kale salads is that the leftovers are just as good… which is what I brought home to photograph for you. 😉 This is my submission to Deb for this week’s Souper Sundays, to Ingredient Challenge Monday for squash and to Ricki’s Wellness Weekend. 1. In a medium bowl, combine butternut squash cubes with the oil, minced garlic and sprinkle with sea salt. Place on a parchment-lined baking sheet and spread into a single layer. Roast until fork-tender, but not falling apart (around 30-40 minutes). 2. Meanwhile, mix the kale, lemon juice and salt with your hands, massaging it together. It should wilt into half its volume after 3 minutes or so. 3. Make dressing by whisking olive oil, white wine vinegar, salt, agave and mustard together. Pour over kale, toss to coat. 4. When the butternut squash has finished roasting, remove from oven and let cool for 5 to 10 minutes. Add to kale and gently toss together. Stir in the pomegranate seeds, and garnish with lemon zest. Season to taste. Serve. This sounds like a fabulous salad! Janet that looks wonderful, bright jewel colours and so healthy to boot! Look GORGEOUS Janet! Nicely done. I want. I just tweeted about this salad! It’s next on my must-make list. I bookmarked Sarah’s salad just yesterday to make for Christmas! One of my uncles can’t have poppy seeds, though, so now I’ll be making this! It’s official. I love this! One of my favorite winter salads/sides dishes it to combine either roasted winter squash or sweet potatoes with a bitter green and then top with either some dried cranberries or fresh pomegranate! Delicious, pretty, and full of healthy stuff! This looks incredible. I think I will make this salad for Christmas dinner! love this salad! 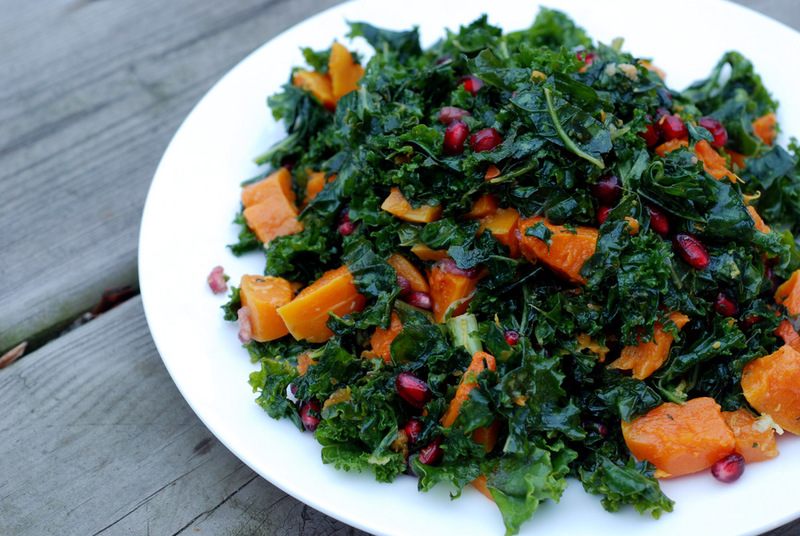 i love roasted sweet squash over greens and the pretty pomegranate always adds a fresh crunch! perfect for right now! I love all the changes you’ve made–this looks fabulous. I think kale salad leftovers are even better the next day. 😉 Thanks for sending this to Souper Sundays.